Chris Boardman, former cycling world champion and Olympic gold medallist, has these tips for getting staff on their bikes. Building a cycling community at work is a great way of encouraging workplace relationships and increasing motivation. Consider introducing a buddy system, which matches people who are cycling the same way so they can ride together. Organise regular social rides, develop a dedicated Twitter feed or website, or produce a regular newsletter, to make sure staff stay interested. There is safe, convenient bike parking all over London, on streets, at stations and at many work places. If a firm doesn’t have parking nearby or on-site, free stands are available from TfL or there are lots of cheap and easy-to-install stands that can be placed within a building. Providing lockers at work also means staff can store their helmets and clothes securely. Consider relaxing dress codes so staff can dress down on days when they don’t have external meetings. This means they’re not restricted by suits and high heels and can wear more comfortable clothes to cycle in. Many people who cycle to work welcome the opportunity to take a shower on arrival at work. Often, these can be provided at minimal expense by converting space within existing premises or by installing purpose-built portable buildings. Providing towels, hairdryers and irons is also a welcome nice-to-have. If there aren’t showers, there are clubs/gyms available that offer cycling facilities and showers that employees can use before and after work. Learning the basics of bicycle maintenance is an important aspect of being a safe cyclist. Call upon volunteers around the business to help or look into offering courses or on-site visits from bike experts, to ensure employees are cycling safely. There are a number of free courses and workshops available, which can help cyclists reduce the cost of bicycle maintenance by completing basic tasks such as replacing brake pads and oiling the chain. Look at TfL or London Cyclist for courses. The Government’s Cycle to Work scheme allows employers to offer bikes and cycling equipment to employees as a tax-free benefit. Through this, the employee usually pays a monthly rental, which is deducted from their salary before national insurance and income tax. This means that their taxable income is smaller, so they pay less tax. If employees don’t have a bike, encourage them to use a Barclays Cycle Hire bike to get around on short journeys. It’s very simple – ride it where you like, then return it, ready for the next person. With 8,000 bikes and 570 docking stations in across the Capital, it’s easy and people can just turn up and go 24 hours a day. Supplying cycle training for staff, or helping them find it for themselves, can be a useful way of encouraging those potential cyclists who might be a little nervous about even attempting to cycle to work. Free and subsidised cycle training is available for businesses within most London boroughs. A workforce that regularly cycles to work will be fit and healthy. For that reason alone, cyclists can be relied upon to be more alert and productive than their less active counterparts. Consider incentives to encourage and reward staff who cycle. These include cheap breakfasts; free fruit or discounts on bikes, accessories or clothing by arrangement with a local bike shop. Businesses should encourage cycling employees to plan their journey to and from work in advance. During the Games, there will be some changes to cycle routes and roads will be much busier so plan the best route in advance. Look at www.getaheadofthegames.com for information on how roads will be affected and regularly update staff on changes. 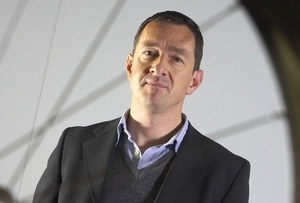 Chris Boardman is the cycling ambassador for Get Ahead of the Games. Get more tips on cycling and getting around during London 2012 by following @GAOTG on Twitter.